The Show Must Go On!!! Wicked GT 2016 coming in March! – The Battle for Oz Tournament Series! If you’re local to the Kansas area and are still interested in Warhammer then do your best to come be apart of the Battle for Oz Tournament Series that we hold every other month at Hero Complex. This is a (somewhat) narrative approach that we’re taking for the tournaments and it’s seen as a storyline that leads up to the final battle which will be the Wicked GT 2016. There’s a points system that tracks all the players and, in the end, the player with the most points will become the Battle for Oz Grand Champion! Round 1 of the Series, The Scarecrow’s Wrath, took place on August 15th and Round 2, The Tin Man’s Revenge, will take place on October 24th. We currently have 10 people signed up and will only grow as we continue to push Warhammer and play the game that we all love. So if you’re free and want to play some 8th edition Warhammer, please visit this link for all the information you need about the Tournament Series and when the next tournaments will take place! – Warhammer 8th Edition! As stated earlier, we still have a large group that supports Warhammer 8th edition, which is why we’ve decided to push forward and move on with our original plans. There may come a time over the next few months where we start to transition to Kings of War (or some other game) but for now the love for Warhammer is still strong here in the Midwest. People love it, people want to play it, and people have asked for the Wicked GT 2016 and so that’s our goal – to bring everybody together for the 2nd Wicked GT! Any changes made to rules over the next few months will be made known here on the Wicked GT website, so make sure to check back. As it is right now, we are running the 8th edition rule set of Warhammer Fantasy Battle. Cost! This year we are going to charge less for the Wicked GT! Initially we charged a little bit more to offset the cost of the tables but now that they have been purchased we are passing those savings on to you and so we’re looking at making the Wicked GT 2016 somewhere in the range of $40 to $50 per person, as opposed to $60/$65 from last year! When we finalize the price you’ll see it right here! Golden Toto Painting Competition: This will be back and better than before. Updated scoring rubrics, new categories, and new rules will call on all of the best painters around to showcase their skills at the Golden Toto Painting Competition! 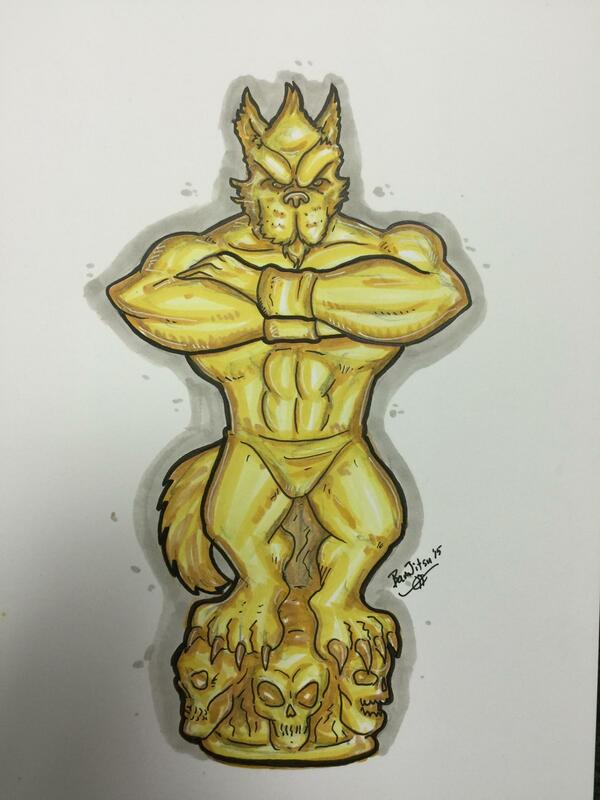 New this year also… Brian Hunter (@bambamhunter), who is currently doing all of the artwork for each of the Battle for Oz Tournament Series, is going to sculpt actual Golden Toto trophies to hand out to each winner of each category! Brian is seriously talented when it comes to this stuff (make sure to check out his fan page) so we can’t wait to see what he has in store. Last year he did the artwork for the Wicked GT as well as the Painting Competition! This is what he drew up for the Golden Toto Painting Competition! More to come as we get updates from Brian! 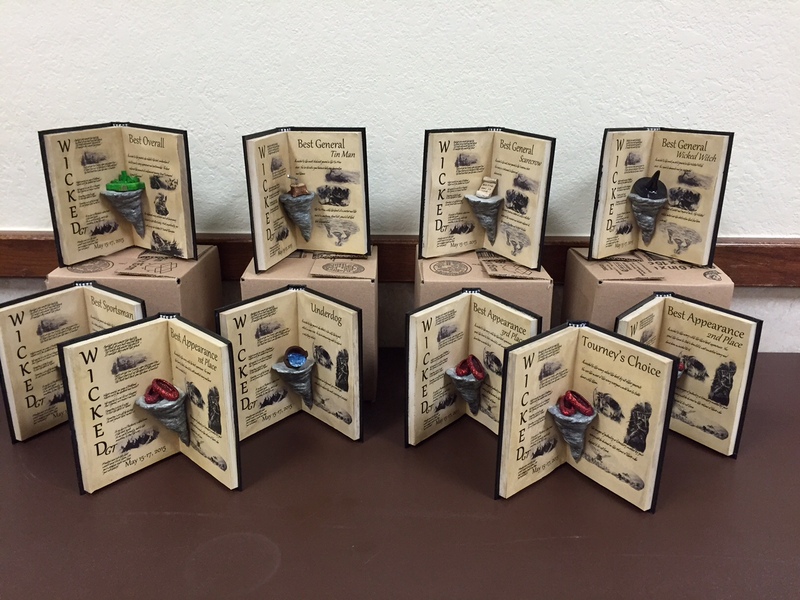 Custom Trophies! This year we are bringing back the custom trophies that you can only find at the Wicked GT! If you missed these last year then do your best to participate this year because being able to walk home with one of these trophies can only be found right here! Chris McArthur made each of the 11 trophies and we aim to bring these back this year as well! Booze! That’s right! We’re bringing the bar back with drinks and beer that will be available throughout the weekend of the Wicked GT 2016 (@thewickedgt)! There could be some changes to this for this upcoming year… mainly a small fee that would serve as a “weekend pass” to have unlimited drinks. This fee will be small and will serve only to help with the cost of the alcohol and supplies for the weekend. This is not set in stone but something we will know more about as the weeks pass. Stay tuned! Updated Scenarios! We will make some changes to the scenarios from last year and work on the faction abilities as well so that we can bring you an unforgettable gaming experience! Time Frame! As of right now, we are targeting March 2016 for the time frame for the Wicked GT. We’re currently working with the hotel to determine open dates and once we have a firm date we will post that here. But for now just want to make sure everybody is aware that we are going to have it in March 2016. Social Media! If you have Twitter then make sure to follow us @thewickedgt and to like our Facebook page found here. Everything we post on this page will be posted on both Twitter and Facebook pages so if you don’t happen to catch updates on one thing then you’ll likely catch it on another! There’s plenty more to come over the next several months but the mail goal for this update is to raise the level of awareness that the Wicked GT 2016 show will go on and we will bring it to you live and up front in March 2016! So many more updates to come so make sure to follow us on Twitter, Facebook, and bookmark this page so that you can get all the updates as they are made available. We’re looking forward to another great GT that brings around some of the best gamers in the country! Warhammer lives on in the Midwest so make sure that you’re a part of it! Stay tuned for more! This entry was posted in General Updates and tagged @thewickedgt, Golden Toto Painting Competition, Grand Tournament, Hero Complex, Warhammer Fantasy, Wicked GT. Wicked GT 2016 will be Fantasy Battles: The 9th Age!